Today, we’re excited to take the wraps off a new version of LivePlan that’s designed to help you grow a better, smarter business. Starting and growing a business is a hard enough task on its own. The tools that you use to help your business grow and succeed should make your life easier, giving you more time to focus on building your business and getting more customers. That’s why we’ve focused on making LivePlan faster, easier, and more powerful. We love the new app and think you will, too. Since LivePlan launched in 2012, we’ve learned a lot. While we’ve added many, many new features since the initial launch, the overall look and feel of the app hadn’t changed much. This new version of LivePlan is a reflection of our learnings over the past few years and a direct result of your feedback. We’ve given the app an entirely new look from top to bottom, making key features easier to find and easier to use. From creating your plan to forecasting and budgeting, you’ll find that everything is simpler and presented in a more logical way. The new app design is a pleasure to use and a more effective tool for starting and growing your business. As a business owner, time is the one thing that you just can’t get enough of. For this new version of LivePlan, we focused on making the app as fast as possible so that we can give some time back to you. The new app is faster in almost every way, but especially as you switch between screens and work with your budgets and forecasts. Some parts of the app are as much as 10-times faster than they were before and we think you’ll really notice the difference. 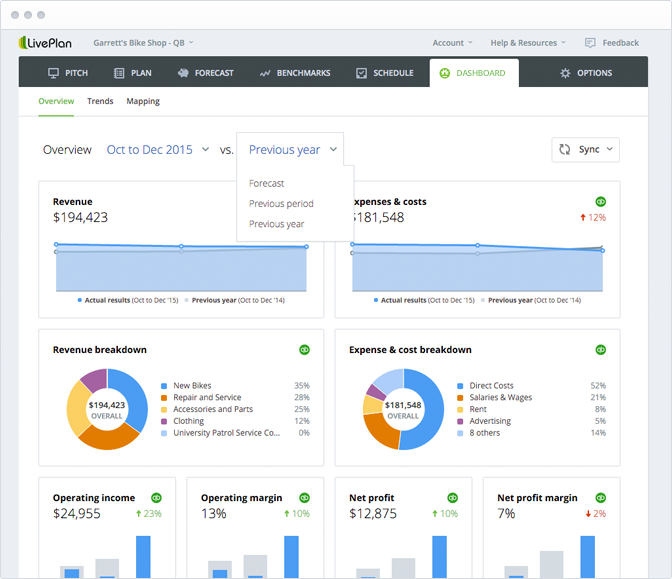 The new LivePlan has a completely re-built budgeting and forecasting engine, designed to make working with your numbers faster, simpler, and better. When you’re building your forecast, making sure that you always have enough cash in the bank is critical. LivePlan now lets you easily experiment with your key cash flow assumptions and see how they impact your cash. See what happens if your customers take longer to pay you. Experiment with the percentage of your sales that are on credit. LivePlan will tell you when you need cash and when you don’t. That’s the key information you need to figure out how much funding you require to run your business. When you add things to your forecast—revenue streams, direct costs, expenses, etc.—you can now easily control the order in which they appear in the table. Just click and drag to reorder. It’s simple. And, if you want to edit your numbers, just click the row label to get right into edit mode. No need to scroll to find the “edit” button. When you’re reviewing your budgets and forecasts, sometimes you want to drill into the numbers to get additional detail. And, sometimes you want exactly the opposite—just a simplified view. The new LivePlan gives you both a simplified and a detailed view of your numbers, allowing you to drill in and see the details when you need them and collapse the view when you don’t. Any row in a budget or forecast table now has an arrow you can click, showing you the detail you need, when you need it. You can also show and hide the monthly detail in your forecasts with a simple click. You choose if you want to view just your annual totals or if you want to see the monthly detail. Use the “annual only” view for a simple summary of your business, or dive into the monthly detail to explore seasonality and other trends in our forecast. Instead of inputting each employee, you can now input groups of employees who are all paid similarly. For example, you might plan on hiring a customer service team for your company, or a team to work on assembling your products. 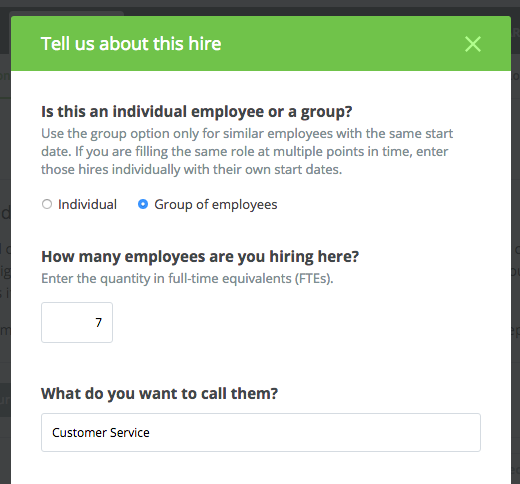 LivePlan now lets you add groups of employees in one easy step. You can also now classify employees as “direct labor.” This is especially useful for manufacturing companies whose employee expenses contribute to their gross margin. 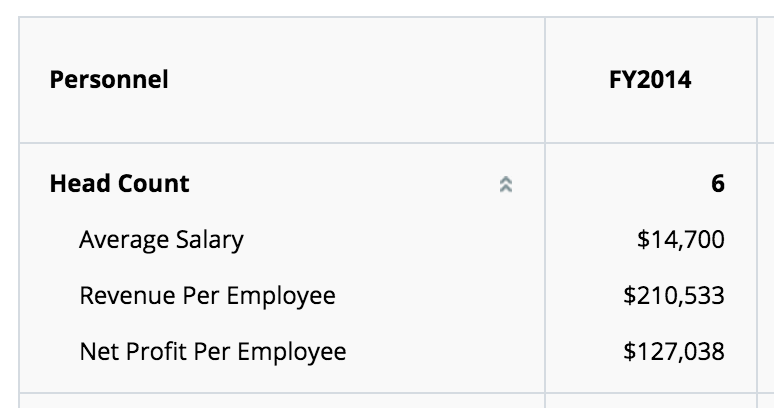 The other really cool thing about LivePlan’s new employee forecasting tool is useful metrics like average salary per employee, revenue per employee, and net profit per employee. That’s all available right in your forecast. In addition to all of the changes to LivePlan’s forecasting features, we also took a fresh look at the business plan outline. We wanted the business plan to reflect what modern investors and bankers are looking for in a plan while also helping you create more useful, lean plans. LivePlan’s new business plan outline accomplishes this. It helps you focus on identifying the key problems you are solving for your customers and how your solution is right for them. And, it produces a lean business plan that’s easier for investors to read. We’ve made sure to include everything a good business plan should have and removed everything that wasn’t necessary. LivePlan business plans have always stood out from the crowd and the new changes to the business plan outline will make your plans even better. Even though LivePlan’s new business plan outline is a great starting point for any business, you might want to make some changes. Now, you can add or remove any section from the plan. If you don’t want to share your financial plan, you can easily remove it from the plan. Or, if you want to completely customize the outline to meet your needs, you can do that, too. All of LivePlan’s original charts are still there, too. Mix and match as you like or just go with our default settings for a great looking business plan. There are hundreds of other changes we’ve made to LivePlan and there are many more exciting features in the pipeline for the coming months. Check out the app and, as always, please tell us what you think. We’d love to hear from you. Find on Twitter @liveplan or contact us via phone, chat, or email. Or, just leave a comment below.